Excellent quality 7 in tall standard humidity dome with straight sides allows use of all plant sites in the propagation tray. The dome has two clear vents that can be opened or closed to control humidity and a built-in handle for easy removal. Fits snugly on standard 10 x 20 in propagation tray. 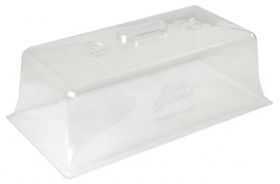 Replacement circle vents are used to replace lost or broken vents on your Super Sprouter® propagation dome.